↑ Smith, Archibald William (1997). A Gardener's Handbook of Plant Names: Their Meanings and Origins. Dover Publications, 39. ISBN 0-486-29715-2. ↑ "FAO". Faostat.fao.org. 8 August 2012. http://faostat.fao.org/site/535/DesktopDefault.aspx?PageID=535#ancor. Retrieved on 8 August 2012. ↑ "Nutrition Facts, Apples, raw, with skin [Includes USDA commodity food A343"]. Nutritiondata.com. http://nutritiondata.self.com/facts/fruits-and-fruit-juices/1809/2. Retrieved on 2013-01-03. ↑ Maher, Theresa. "Antioxidants Found in Apples May Extend Lifespan". Journal of Agricultural and Food Chemistry. 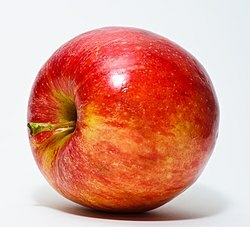 http://web.archive.org/web/20110720103717/http://newslocale.org/health/hnews/antioxidants_found_in_apples_may_help_extend_lifespan_2011030411461.html. Retrieved on 24 March 2011.